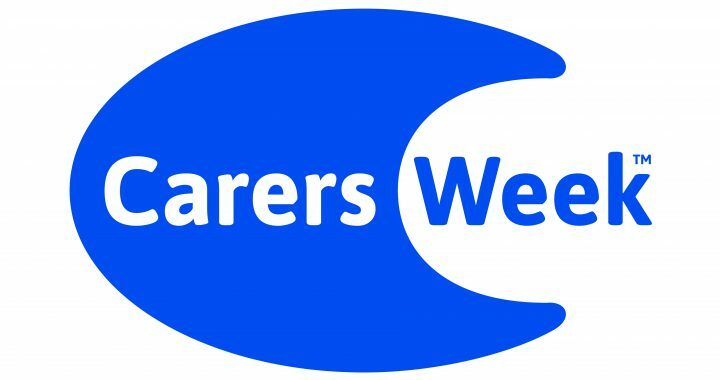 Carers Week starts today, a time to say a massive ‘Thank You’ to all carers, no matter what age you are, who you care for and support, where you live or how much time it takes. Every act of caring matters and makes the world a better place, there are no league tables or competitions for world’s best carer. But Carers Week is also a call for action, action to make life better for carers now and in future. It was a remarkable day. We heard powerful stories of what life’s like when you’re caring for someone living with dementia. How touch and emotionally demanding caring can be; we lose contact with friends and often have to give up the activities that make life sweet and define who we are. Our lives become smaller. We heard of the loss that caring for someone with dementia brings, but also the great courage and resilience of carers, re-making their lives and relationships, finding life and positivity. All the carers spoke of the importance of having ‘time for me’ whatever that means for that person and of valuing precious memories and moments of normality and love. ‘Being me’ can be a struggle when you’re caring for someone with dementia. We’re looking forward to working together to ensure Carers have much more say in the things that matter to them and their voices and experience have a direct impact on the Carers Strategy and delivery. 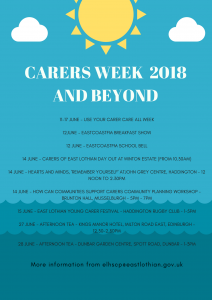 East Lothian Health and Social Care Partnership is celebrating carers with a range of events. 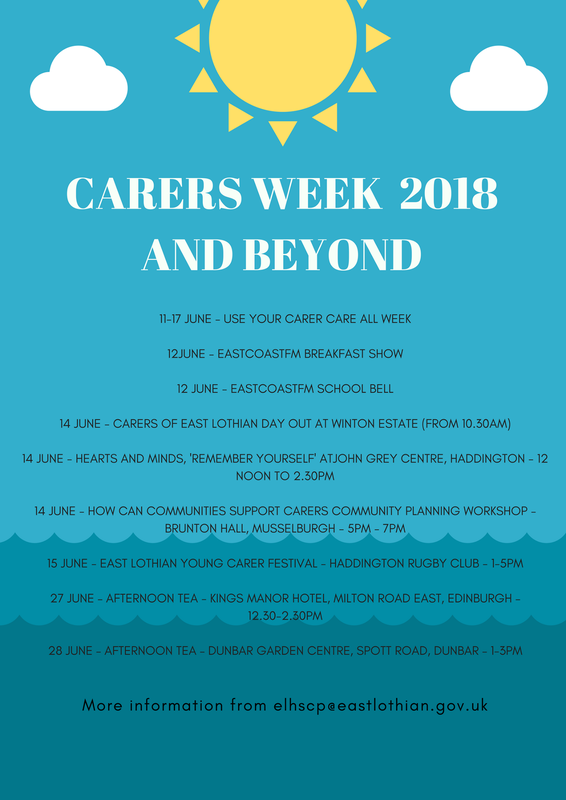 The Carers (Scotland) Act came into effect on 1 April 2018 and is aimed at ensuring carers are supported in their caring role. East Lothian is currently consulting on a local strategy. 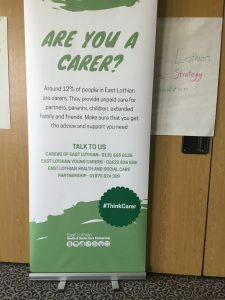 https://eastlothianconsultations.co.uk/adult-wellbeing/draft-east-lothian-carers-strategy/. 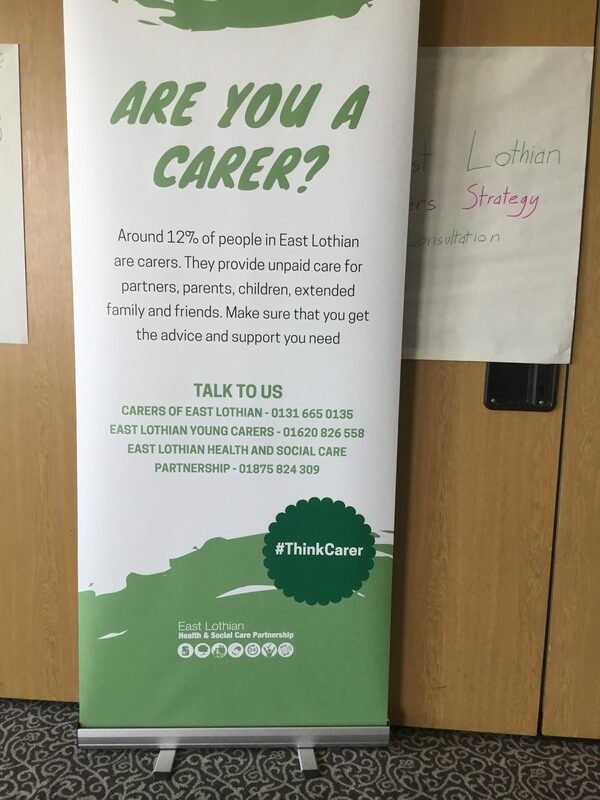 The aim of the Strategy is to provide support across a range of services and promote community support so that carers of all ages across East Lothian get the help and support they need to maintain their quality of life, health and wellbeing. Provide information and advice for carers, including emergency and future care planning, advocacy, income maximisation and carers’ rights. There are important moral, practical and financial reasons for supporting carers. We are of course worth it! Family and friends provide most of the care for people with dementia and continue to provide critical support to the end and beyond. We are critical to the effective working of formal care services from the planning and assessment stage to delivery- without carers care services cannot cope. Identify carers – by raising awareness of carers and caring across the community, in workplaces and hospital admissions. We know that many people don’t describe themselves as carers but as husbands, daughters, friends. We also know that caring for someone with dementia can lead to social isolation, so a broad approach, working with communities and local networks is a really effective way to reach people who provide care and support, regardless of whether they call themselves a carer. A community approach also means using formal and informal networks which can reach deep into the community. It doesn’t happen by magic through and requires resources and support to make it work. Provide information – the draft strategy helpfully outlines that we need different information at different stages and lists the large number of bodies that provide information. But it doesn’t address Post Diagnostic Support (PDS). 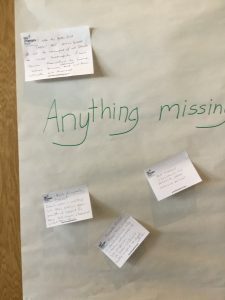 PDS is focussed on people with dementia and usually carers, with conversations aimed at helping people plan ahead, stay connected to their communities and have a quality of life. However, not everyone with Dementia gets access to PDS, some carers have said their partners have declined PDS so they have no access to support. There are also significant issues about how people manage and navigate the massive amounts of information available over a long period of time. 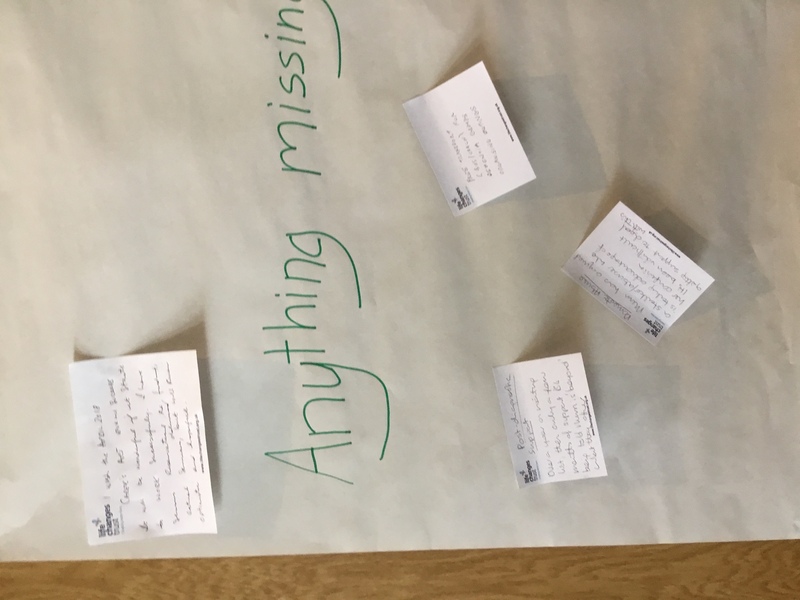 We need a wide range of information at different stages – what dementia is and how it affects people; how other people cope; what’s on that’s accessible for people with dementia and all the time dementia changes and challenges in new ways. Critical issues for carers are around transport, in particular when people stop driving; housing options and adaptations and how to maintain a normal life as possible. Carers also want to feel they are not alone. Promote Health & Well-Being – Breaks & Balance – Carers need time off from caring, emotionally as well as practically so we can be ourselves again. For some we might want to be a wife or son again; for others it might be to garden or climb a mountain, or just have coffee with friends. The challenge for the strategy is how to be creative and flexible. Many of the challenges are similar to those round Self Directed Support. The Strategy needs to look at things through Carers’ eyes – how can it support us to stay in touch with friends and how do we create Carer Friendly Communities so that we are supported to keep life as normal as possible and a greater focus on emotional support and counselling. Of course health matters, but we need to define health broadly, about the quality of daily life – family, friends, housing, transport, money (not just) benefits and what happens after caring ends. 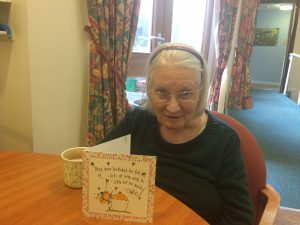 Planning ahead – It is hard to plan as a carer, especially as dementia is a complex condition with a unique and unpredictable trajectory, it affects everyone differently. Plus as we learn more about dementia we find new strategies and ideas. The Strategy must look at how Post Diagnostic Support fits in and how we support carers for people with dementia who are not eligible for PDS or who have to wait. Again Housing really matters, we need choices and advise about options. We also need to plan financially and round employment. Respect and Involvement – Of course Carers need to know we are valued and appreciated. An effective Carers Strategy requires the people we work with have a good understanding of dementia, the ability for quality conversations with us and the people we care for and TIME. This requires a completely different way of working for many professionals, a focus away from tasks to relationships; respecting, valuing and working with what we know about the person we care for and what works. Respect must work both ways and we want paid carers to be valued and respected too. This is going to be one of the hardest but most important changes that need to be made – finding enough high quality workers who are trained, confident and flexible to work in new ways to meet our needs. Short cuts won’t work. Work with Employers – more and more carers are juggling work, caring and other family roles. Workplaces which support carers can make a huge difference. Often we just need flexibility and trust, but as things progress, we may also need paid leave or emotional support. It has to be more than policy, managers and HR departments must translate aspirations into practice. Carer Friendly Communities – Being a Carer for someone with dementia can be very lonely. When you have to be the whole world for another human being, the stress is enormous and guilt and failure are inevitable. Feeling part of the community can make a huge difference, even if it’s a smile or friendly chat when we’re out and about – feeling human and that we belong to the bigger world. There is a clear link between carer stress and worsening dementia symptoms and dementia is associated with a significant reduction in friendships and networks for people with dementia and carers. Carer Friendly Communities help to promote social relationships, friendship, a sense of belonging and being part of something. In DFEL, we’ve found a well-spring of respect and concern for carers of people with dementia and how we in communities support each other. How does the strategy stack up? There’s lots of good stuff in the strategy, lots to build on. Plus a real commitment from the policy makers – Trish Leddy and Ashley Hardy. As a Carer, I had very simple outcomes. Mum and Dad happy, comfortable and together; us all having as normal a life as possible; and to retain a sense of me and dignity, with no regrets at the end. Would the Strategy help me? Yes and no. The things that made a difference to me over 20 years caring were: a supportive line manager; being involved as an equal in decisions and planning with professionals; independent advocacy; sheltered housing options integrated into community, ideally walkable; good quality, flexible care at home that left Mum feeling a friend had been to see her; places for Mum and Dad to have fun and be with friends whilst I did other stuff (respite for us all!). And finally a care home that became our family home where Mum had a good death. Over time, the internet became a more useful source of information about gadgets and ideas that looked normal and did the job. The things that increased my stress and harmed me and my parents included staff who ignored us and didn’t understand the basics about dementia; inflexible and unsympathetic bosses; poor quality services that created harm; professionals who did things to us, in a hurry with little respect or humanity and a lack of information and support specifically linked to dementia, planning ahead and peer support. We stumbled on solutions through trial, error and desperation. How useful to have known earlier of how the arts and creativity can transform caring and living with dementia. How we understand things matters. Research shows that seeing dementia as the loss of the person leads to greater carer stress than seeing dementia as a disability. The success of the Carers Strategy depends on it being able to make real improvements in our daily lives, helping us maintain at least a sense of normal life, even if only for moments at a time. It also depends on other strategies, including Housing, Growing Older, Dementia and the review of sheltered housing. It is about recruitment and training, pay and conditions. The Carer Strategy does not stand alone. In this Carers Week, we can all do something to make a difference. We can share your stories and ideas and comment on the Carers Strategy, what we think works or would have worked for us and what needs to change. It might be too late for some of us, but at least we might help the carers of the future, including our own children and family, who may well be caring for us.